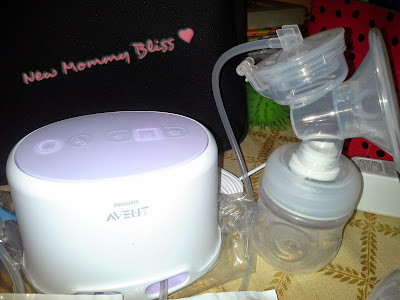 Philips Avent Double Electric Comfort Breast Pump Review! Disclaimer: I was sent the below mentioned product in exchange for an honest review. All opinions are 100% Honest, my own, and are not influenced in any way. This Post contains Affiliate Links. Looking for a breast pump can have a new parent lost in a very unfamiliar world! When I gave birth to my daughter I was unsure of what to look for. I didn't know what I wanted or what I didn’t want in a pump. What I received was the most highly rated Breast pump with the most uncomfortable pump… I wasn’t happy with it. Philips Avent Double Electric Comfort Breast Pump is a whole different story! The first thing I noticed when I removed it from the box was how compact and sleek it appeared! 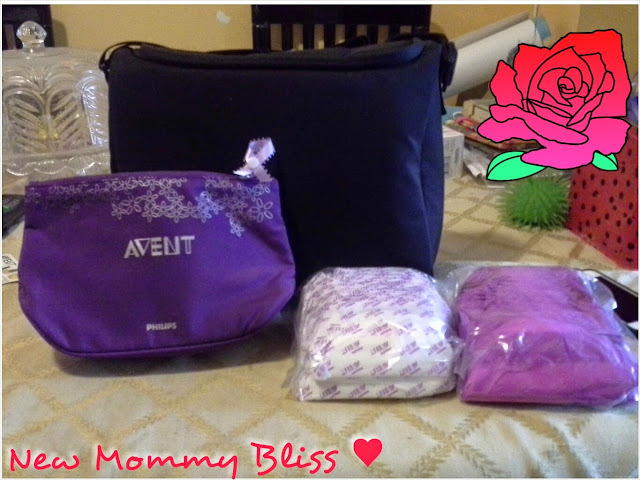 The pump comes with a Beautiful black travel bag (With purple inner liner) to store everything you will need if you're out without baby and for you to keep everything together in one place when you're home. As well as a cute cosmetic type bag, a small purple ribbon for you to snap on to your bra so that you won't forget which side comes next, Daytime Breastfeeding pads, and Nighttime breastfeeding pads. When I opened up the Black Travel bag I found the motor which has tubing coming out, which is for connecting to the cap and silicone diaphragm that are inserted into the body of the pump. The massage cushion covers were put in place with the Pump caps for when they aren't being used, as well as the valve. The pump comes with (2) four ounce bottles, however, it is compatible with the Philips AVENT nine ounce bottles in case you produce more than four ounces per breast per session. I used to pump 6-8 ounces in one session, then it went down to barely 5oz a day! After feeling this pump, I realize my old pump was the problem and not me! The motor unit is compact and simple to use. There are only five buttons on top which are: power, stimulation and 3 different level buttons. When turned on, the pump automatically starts in stimulation mode, then after your milk starts flowing you can adopt a slower or faster suction by using one of the three buttons to the right. When I plugged in the pump I was really curious to see if it was as loud as my first pump. After turning it on I was very excited to hear that this pump is incredibly quiet! Being a first-time mom, I was so embarrassed of being heard pumping and I was also afraid to wake anyone (especially baby) when I had to pump at night. With this Double Electric Comfort Breast Pump, I would've never had to worry about that. The Comfort Petals have a super soft velvety texture that gives a warm feel to your skin for comfortable and gentle stimulation of your milk flow. During pumping, it will gently mimic your baby’s suckling / latch for natural let down and clinically proven effectiveness! The comfort level this creates is perfect, no more hard plastic that needs pressure to create a seal (Which is why I started to dislike my old one). There is no pressure needed to create the perfect seal with these silicone massage cushions. Overall Thought: This pump is awesome for the mom who works outside of the home and needs to pump multiple times a day. It gets the job done all with making sure you are comfortable! It is super easy to clean, assemble, and operate! I love that the carrying bag can pass as a purse. With the price retailing for approximately $274.99 I do believe it's a great investment. Some things I would love to see is a Battery operated option in case I am in a place without an outlet as well as a built in freezer pack in the travel bag so that I won't have to carry a separate cooler for the pumped milk. To be honest, I would only pump into breast milk bags while outside. It takes up less space and it's more convenient to travel with. What do you LOVE or HATE about your current Breast pump? Oh man- I had a Medela and I HATED it! I wish that I had gone with this one instead! I will have to share with all of my pregnant buddies!